BugDoc Dave here with my “bonus” Stretch Tuesday discussion. It’s has been a great month seeing all the pictures sets that folks have sent in. It appears that most of the sets were pitcher and tumbler sets and table sets of creamers, sugars, spooners and covered butters. Not sure what HOC plans to feature next month, so I wanted to try and finish my console sets in stretch for this month! In the first Tuesday of this month, I presented console sets by Central Glass, Diamond Glass (previously Dugan) and Fenton. My first sets tonight were made by Imperial. They made quite a few console sets in their numerous lines but only a few of these were iridized. 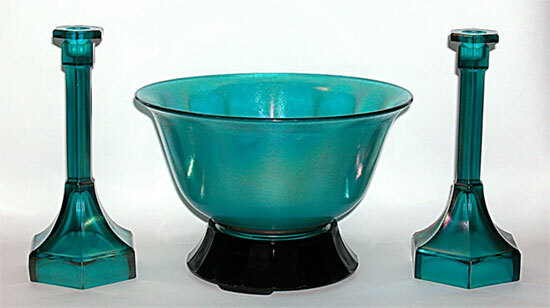 My first set uses a large wide panel bowl (12-inch, #6569) with the #6009 candleholders, in Green Ice (teal stretch). This candleholder comes with plain iridescent effects (shiny throughout) and true stretch (the stretch effect is most evident on the stems!). The next set is in the #320 (“double-scroll) in ruby stretch. 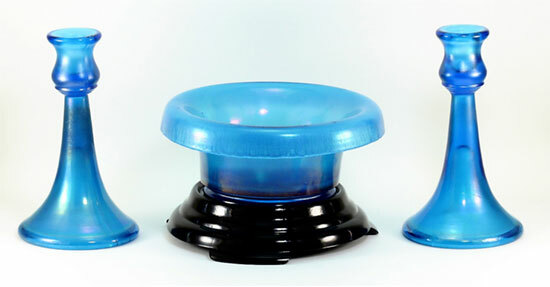 The bowl can be in shiny carnival effects or have a true stretch effect. The candleholders rarely have anything more than satiny iridescence. 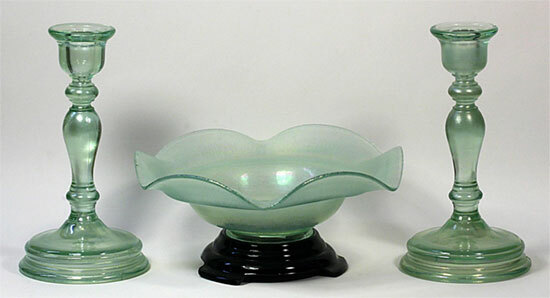 Lancaster Glass made a rather limited range of shapes and forms, but their candleholders are easily paired with two of the bowls and one of the comports. Here is a set in crystal stretch decorated with one of their typical floral designs. Northwood featured several console sets in their catalog pages. My first one is their narrow panel bowl (#301) pared with their 8-inch hexagonal candleholders (#657) in their opaque Jade Blue color. Northwood also made a high-standard black base which I’ve used in this set. The set consists of the #717 bowl and 10.5-inch tall #696 (Colonial) candleholders in Russet. This exact set is featured in one of the catalog pages! Console sets were often decorated with matching motifs. In this set, the glue chip decoration was used to create a frosted etching effect which was painted over with gold paint. 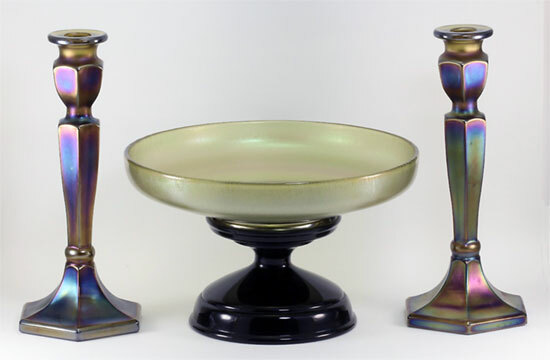 This set uses the #721 footed bowl with the 8.5-inch #695 (Colonial) candleholders. 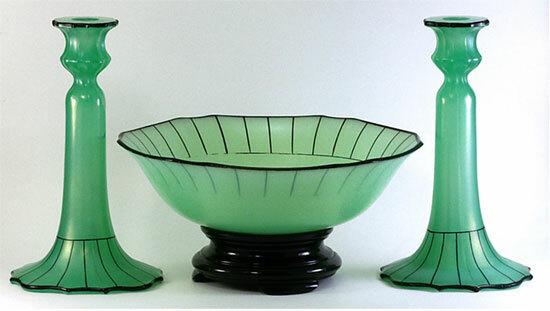 U.S. Glass (including Tiffin) featured a large number of console sets in their catalog pages, but most were in shiny or satin glass. However, with their large line of bowls and candleholders there are many possibilities. 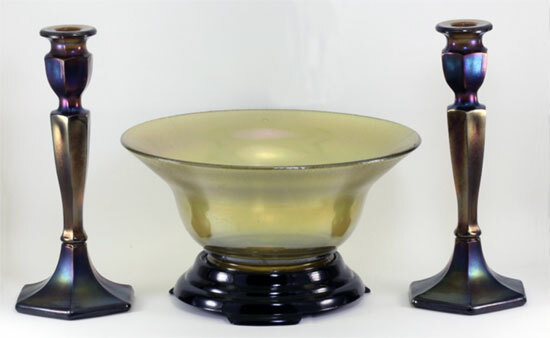 This set uses the #310 candleholders and an unidentified line number bowl that has a scalloped rim. This set was obviously decorated by the same company or person and the color is in their opaque green glass. A bit surprising is the number of Vineland console sets that can be assembled. They made three different candleholders and several bowl sizes. Here is a set in what we call “Coke Bottle Green” that uses their spindle-shaped candleholders (only known in this color) and a smaller (8-inch), 6-crimped bowl. 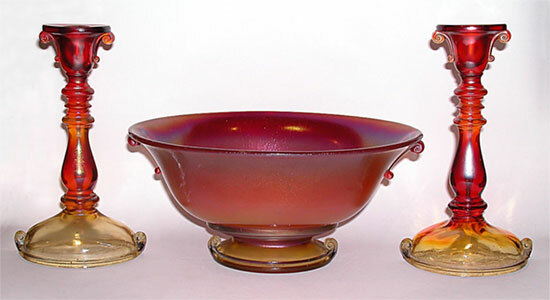 Here is the larger bowl and 10-inch (Colonial) candleholders in their “Old Gold” (amber) color. 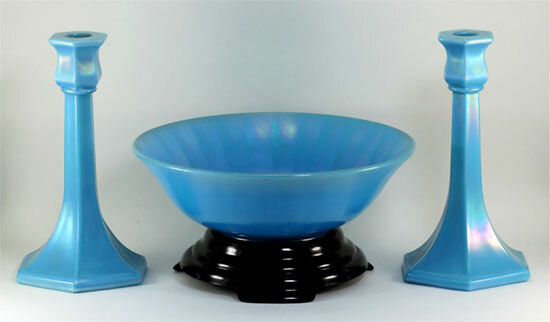 Finally, here is a Vineland wide-based bowl with rolled rim paired up with their 6-inch, trumpet-shaped candleholders in their “Tut Blue” color. Not bad for a “minor” company! !